From coffee cups to fast food containers, polystyrene foam—what most of us call Styrofoam—is used every day all across the country. And it ends up in our rivers, lakes and oceans, endangering wildlife and polluting our water. Polystyrene foam is one of the worst forms of plastic pollution because it never fully degrades. Every single bit of polystyrene foam ever made is still out there—even if it’s just in tiny pieces called microplastics. Something we use for only a few minutes shouldn’t pollute our planet and endanger wildlife for hundreds of years. That’s why, at Environmental Action, we’re working to ban single-use plastic foam cups and takeout containers. In early April, a young sperm whale washed up on a beach in Spain with 64 pounds of human-made trash in its digestive system. 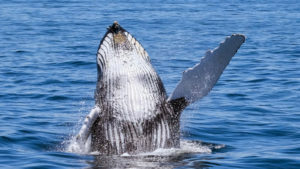 The whale died of inflammation of its abdominal lining—the amount of trash in its system was so enormous that the whale couldn’t get rid of it. For a bird or fish or turtle, it’s easy to mistake a small piece of plastic for food—especially when there are millions of pieces of plastic floating in the ocean, including some so small we can’t see them. The young sperm whale isn’t alone—scientists have found plastic in hundreds of species, including in 86 percent of all sea turtle species and 43 percent of all marine mammal species. And when animals ingest this waste, it can block their digestive tracts and cause them to starve. Whales and other wildlife are far more precious than foam coffee cups or takeout containers. One place to start is getting rid of the plastic foam that ends up on our beaches and in our oceans in the first place. That’s why we’re calling for a ban on polystyrene foam in states across the country. Tens of thousands of Environmental Action supporters are taking the lead on this issue—sending messages to their governors calling for bans in their states, and asking local restaurants to stop using foam cups and takeout containers. And now we’re working to keep empowering citizens and raise the profile of this issue nationwide. We can’t allow plastic foam to put our health, wildlife and the planet in danger. It’s time to act to reduce and rid our planet of plastic pollution.